Edwards pursues his chance in the championship. Project 1 has two highly motivated junior drivers battling for the best rookie position. Edwards is ambitious about the forthcoming race in Oschersleben: “I will be fully on the attack at the weekend. If we’re offered a chance to reduce the gap to Kévin Estre, we’ll be there. There’s no reason to mope. On the contrary, such a challenge motivates me.” A look at the remaining season shows clearly that nothing is fixed yet. With Oschersleben, Zandvoort and the final in Hockenheim, there are still six races left for the title contender to win, and a total of 120 points to be taken. The two Project 1 rookies, Sean Johnston and Jeffrey Schmidt, are motivating themselves in different ways. 22-year old Sean Johnston is looking forward to his parents visiting; they have made the long journey from Mount Shasta in California to Europe. This is of course no reason for Johnston to push work on to the back burner: “Of course I’m delighted about my parents’ visit, it gives me additional motivation. It’s really special for me to be able to show them my new motorsporting life here in Europe, and it makes me really proud. But I’ll be totally and utterly concentrating on my job at the weekend, namely driving the car fast.” For Sean Johnston, the trip to Oschersleben will be a new challenge, for although he has driven numerous test laps on the track, the adrenalin-filled races are always something completely different. Jeffrey Schmidt’s incentive is his newly won prospects in the battle for the rookie championship. After the two races at the Nürburgring, the ‘Deutsche Post by Project 1’ team youngster has narrowed the gap to the leader, Porsche Junior driver Connor de Phillippi, to just 10 points. 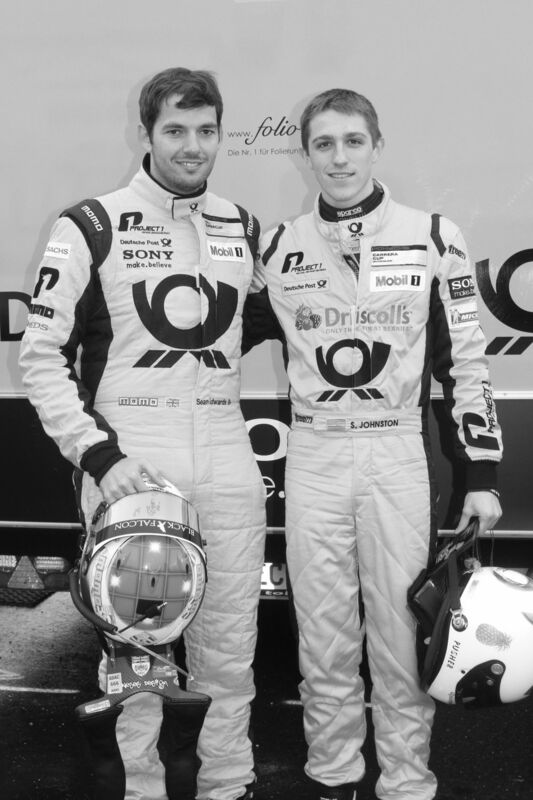 “My goal is clearly to win the ‘rookie of the year’ title in the Porsche Carrera Cup 2013. I’m sure that, at the end, I’ll be right at the top of the table” says the young Swiss driver, confidently. For him, it’s the logical result of having whole package. Jeffrey continues “My performances are improving from race to race and I’m getting more and more used to the car. Sean Edwards is one of the best drivers, if not the best driver, in the field. To have someone like him in the team pushes us unbelievably and we rookies can learn a lot from him, particularly on the circuits which we don’t know that well. Together with top engineer Konstantin Kotitsas and the best team, we have a great package for getting successful results in the last six races.” For the rookies too there are 120 points still up for grabs. Jeffrey Schmidt is the only one of the ‘newbies’ who has so far managed a podium place.